Lucinda Darling thinks she’s ready to get married. Even though Donald doesn’t give her butterflies, the heiress is ready to make her marriage work. She’s got the dress, she’s at the church and her fiancé…is making out with his ex. So Lucinda stuffs her tulle skirts into her tiny sports car and hits the road…only to have her car break down. Jake Parker knows he’s not ready to settle down. But Grandma Hattie is sick, so, to make her happy, he’s returning home to find himself a fake fiancée. When Jake rescues Lucy from the side of the highway, she goes from runaway bride to temporary fiancée. 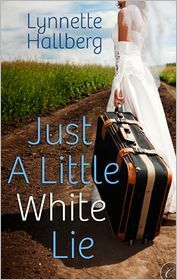 Lucy hopes to escape the public eye in small-town Georgia, but she doesn’t expect to fall for Jake’s charming hometown, let alone Jake himself. Soon Jake and Lucy both start to wish their lie were true. But Lucy knows she must stop their pretense before Jake’s family-and her heart-are hurt so badly they’ll never recover. In JUST A LITTLE WHITE LIE everybody is lying to everybody. It got a bit annoying after a while and the lies weren’t the kind that wouldn’t hurt anyone. I did like the relationship between Lucy and Jake, except for the fact that they fall in love in a few days. After what Lucy has just been through with her ex-fiance (whether she loved him or not) would make any sane women take a little break instead of falling in love days later. The secondary characters helped hold my interest in this story. I liked the author’s writing style and will try another book, but this one just didn’t work for me. Hmmmm…this was on my ‘maybe’ list. Thanks for the review because I’m not sure I still want to read it! This book looks interesting. I love the cover. Everyone tells a little white lie at one time or another. This book sounds good with all telling the little lies. Hmmmm. Maybe I will start with another book from this author. Thanks for introducing me to a new author!